Nothing like a happy hypocrite. Despite whole-heartedly concurring with the council’s decision to do minimal work for the assessment I’m still chuffed to see that Wandsworth is an excellent council according to the Audit Commission. What has been interesting, though, since the council’s announcement are the number of people who – privately and publicly – have backed the council. As far as I know none have gone as far as well and H&F have, in saying that we will offer the minimum co-operation with the review process, but it’s clear that there is a lot of disquiet out there and the process will have to change if it isn’t to be discredited. 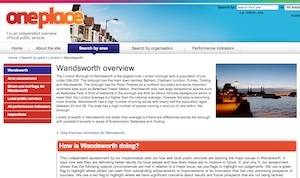 If you are interested you can find Wandsworth’s assessment on the oneplace website (although the second link, at the time of writing, wasn’t working).